Hull City Association Football Club (/ˈhʌl ˈsɪti/) is a professional association football club based in Hull, East Riding of Yorkshire, England. It was founded in 1904. The club participates in the Premier League, the top tier of English football – and their greatest achievement in cup competitions came in 2014, when the team reached the final of the FA Cup. In 2007–08 they achieved promotion to the top flight of English football for the first time in their history by winning the Championship play-off final at Wembley Stadium. Their highest league finish was for the 2013–14 season, in which they finished 16th in the Premier League table. Hull City play their home games at the KCOM Stadium. 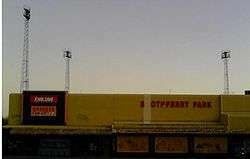 They moved there in 2002 after playing their previous 56 seasons at Boothferry Park—Boothferry Park has since been demolished and been replaced by a housing development. Hull traditionally play in black and amber, often with a striped shirt design, hence their nickname The Tigers. The club's mascots are Roary the Tiger and his sister Amber. For more details on this topic, see History of Hull City A.F.C.. Despite being one of the favourites for relegation in the 2008–09 season, Hull began life in the Premier League by beating Fulham 2–1 on the opening day in their first ever top flight fixture. With only one defeat in their opening nine games, including away wins at Arsenal and Tottenham Hotspur, Hull City found themselves (temporarily) joint-top of the Premier League table on points (third on goal difference), following a 3–0 victory over West Bromwich Albion — ten years previously, they had been bottom of the fourth tier of English football. Hull's form never replicated the highs of the early autumn, with the team winning only two more games over the remainder of the season, but secured their top-flight status on the last day of the season due to other results. On 31 July 2014, Hull made their debut in European competition, in the UEFA Europa League third qualifying round, with a 0–0 draw against Slovakian side FK AS Trenčín before winning the second leg 2–1 a week later. An error from keeper Allan McGregor gave them a 1–0 loss away to Belgian outfit Lokeren in the first leg of their play-off tie on 21 August 2014 with the second leg in East Riding of Yorkshire ending in a 2–1 victory, but away goals marked the end of Hull's first foray into European football. In March 2015 Steve Bruce signed a further three-year deal with the club. Hull were relegated from the Premier League after the 2014–15 season, finishing eighteenth with 35 points after a 0–0 draw against Manchester United, along with Newcastle United securing their Premier League Status after beating West Ham United 2–0. In October 2015 Hull beat Leicester City in a penalty-shootout to take them through to their first ever quarter-final appearance in the Football League Cup. In August 2013, owner Assem Allam announced that the club has re-registered as "Hull City Tigers Ltd," and that the team would be marketed as "Hull City Tigers," removing the "Association Football Club" that had been part of the name since the club's formation in 1904. Vice-chairman Ehab Allam said "AFC" would remain on the club badge for the 2013–14 season, but removed thereafter. During the mid-1970s and early 1980s, the strip was constantly changing between the two versions of plain shirts and stripes. 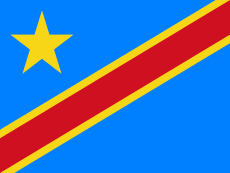 During the late 1980s, red was added to the kits but its duration went no further than this. The early 1990s featured two "tiger skin" designs, which have since featured in several articles listing the "worst ever" football kits. The 1998–99 season introduced a kit with cross-fading amber and white stripes, another experiment that proved unpopular. After the start of the 21st century, the club wore plain amber shirts until 2004, when the club celebrated its centenary by wearing a kit similar to the design of the one worn 100 years ago. In the club’s annual report for the 12-month period up to 31 July 2009, auditors Deloitte stated that £4.4 million had gone out of the club and stadium company to owner Russell Bartlett’s holding companies in loans, while at least £2.9 million of it was used in the take-over itself of the club. A further £560,000 was paid, according to the audit, by the stadium company to Bartlett’s holding companies in "management fees," while at least £1 million was owed to him personally as a "salary." After the warning from	Deloitte, Bartlett gave the club a £4 million loan, "which	brought	the money he had taken out and put in since taking over to about even." Hull City's corporate accounts, as of July 2013, show a £25.6 million loss, on revenues of £11 million, after player and management costs of "just under £23 million." The club has "future tax losses" available of more than £45 million. Another Assam Allam company, Allam Marine, also wholly owned by Allamhouse Limited, revealed in its 2012 accounts that "utilisation of tax losses from group companies" reduced its tax liability by £3.8 million over 2011 and 2012. 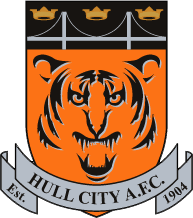 For more details on this topic, see List of Hull City A.F.C. records and statistics. Their heaviest defeat in the league was 8–0 against Wolverhampton Wanderers in 1911. Their heaviest top flight defeat was a 6–1 defeat to Liverpool on 26 September 2009. As of 2 September 2016. For youth and reserve teams see Hull City A.F.C. Reserves and Juniors. As of 18 November 2016. Distant rivals include teams from across the Humber Estuary in Lincolnshire, Scunthorpe United and Grimsby Town. With Scunthorpe's promotion from League One, the 2007–08 Championship season saw the return of a "Humber Derby". Additionally, non-league Lincoln City and York City are said to consider Hull amongst their rivals. ↑ "Hull fight back to reach FA Cup final". BBC Sport. Retrieved 13 April 2014. ↑ "Hull City fans sing at Boothferry Park for last time (video update)". 2011-12-21. Retrieved 2016-08-27. 1 2 3 "1904–1915: The Formative Years". Hull City Mad. 2 January 2002. Retrieved 11 July 2011. 1 2 "Hull City". Historical Football Kits. Retrieved 18 June 2007. 1 2 3 4 5 6 7 8 9 10 "History of the Tigers". Hull City A.F.C. 10 May 2011. Archived from the original on 18 July 2011. Retrieved 25 November 2012. 1 2 3 Peterson, Mike (1999). The Definitive Hull City A.F.C. : A statistical history to 1999. Tony Brown. p. 13. ISBN 1-899468-13-7. 1 2 3 4 5 6 7 8 9 10 11 12 "Hull City". Football Club History Database. Retrieved 11 July 2011. ↑ "Grimsby fish market to open over festive period". FISHupdate. Wyvex Media Limited. 21 December 2006. Archived from the original on 7 June 2012. Retrieved 17 July 2016. 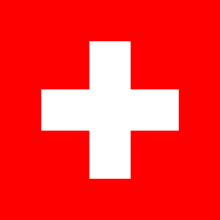 ↑ "1919–1939: Inter War Promise Not Fulfilled". Hull City Mad. 2 January 2002. Retrieved 26 February 2011. 1 2 3 4 5 6 Beill, Andy (6 November 2007). "Boothferry Park". Hull City Mad. Retrieved 26 February 2011. ↑ "1939–1961: The Carter Era and Beyond". Hull City Mad. 2 January 2002. Retrieved 26 February 2011. 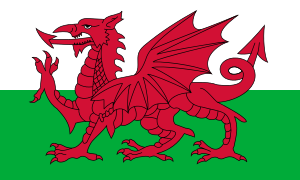 ↑ "1961–1980: Rising under Britton then Decline". Hull City Mad. 2 January 2002. Retrieved 26 February 2011. ↑ Ingle, Sean; Murray, Scott (10 January 2002). "Shooting from the hip". The Guardian. UK. Retrieved 11 July 2011. 1 2 "Club Profile". Premier League. Retrieved 11 July 2011. ↑ "1980–1997: Robinson the Saviour – Boring, Boring Dolan". Hull City Mad. 2 January 2002. Retrieved 26 February 2011. 1 2 "1997–2000: Saved? and Future Prospects". Hull City Mad. 2 January 2002. Retrieved 26 February 2011. ↑ "Following Tigers through thick and mainly thin finally pays off". Yorkshire Post. 24 May 2008. Retrieved 11 July 2011. 1 2 "Hull part company with Parkinson". BBC Sport. BBC. 4 December 2006. Retrieved 11 July 2011. ↑ "Hull unveil Brown as new manager". BBC Sport. BBC. 4 January 2007. Retrieved 11 July 2011. ↑ "Hull capture Windass in loan deal". BBC Sport. BBC. 17 January 2007. Retrieved 11 July 2011. ↑ "Deano's Back!". Hull City A.F.C. 19 June 2007. Retrieved 11 July 2011. ↑ "Statement from Adam Pearson". Hull City A.F.C. 15 June 2007. Retrieved 11 July 2011. ↑ McNulty, Phil (14 May 2008). "Hull 4–1 Watford (agg 6–1)". BBC Sport. BBC. Retrieved 11 July 2011. ↑ McNulty, Phil (24 May 2008). "Bristol City 0–1 Hull". BBC Sport. BBC. Retrieved 24 May 2008. ↑ "The wait ends for Lyon and Hull". FIFA. 28 May 2008. Retrieved 11 July 2011. ↑ "Barclays Premier League – Updated 25/10/2008". Hull City A.F.C. Retrieved 3 November 2008. 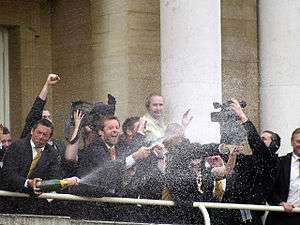 ↑ "Brown hails 'biggest' day – updated 24/05/2009". Sky Sports. 24 May 2009. Retrieved 25 May 2009. ↑ "Hull chairman Duffen steps down". BBC Sport. BBC. 29 October 2009. Retrieved 11 July 2011. ↑ "Club Statement". Hull City A.F.C. 2 November 2009. Retrieved 2 November 2009. ↑ "Hull City relieve manager Phil Brown of his duties". BBC Sport. BBC. 15 March 2010. Retrieved 11 July 2011. ↑ "Wigan draw relegates Hull". Sky Sports. 3 May 2010. Retrieved 5 May 2010. ↑ "Club Statement". Hull City A.F.C. 7 June 2010. Retrieved 7 June 2010. ↑ "Hull City: Dowie's been told thanks, but no thanks after poor Premier League record". Hull Daily Mail. 19 June 2010. Retrieved 11 July 2011. ↑ "Tigers Name New boss". Hull City A.F.C. 29 June 2010. Retrieved 29 June 2010. ↑ "Hull City: Tigers tempted Nigel Pearson with ambitious plans". Hull Daily Mail. 29 June 2010. Retrieved 11 July 2010. ↑ "Hull ban new arrivals". The Sun. 28 July 2010. Retrieved 28 July 2010. ↑ "Hull City secure Spurs youngster John Bostock on loan". BBC Sport. BBC. 6 August 2010. Retrieved 11 July 2011. ↑ "Tigers bring in Koren". Hull City A.F.C. 13 August 2010. Retrieved 13 August 2010. ↑ "Coventry 0 – 1 Hull". BBC Sport. BBC. 12 March 2011. Retrieved 11 July 2011. ↑ "Bristol City 3 – 0 Hull". BBC Sport. BBC. 7 May 2011. Retrieved 29 September 2011. ↑ "Leicester City appoint Hull City's Nigel Pearson as boss". BBC Sport. BBC. 15 November 2011. Retrieved 15 November 2011. ↑ "Hull City appoint Nick Barmby as manager". BBC Sport. 10 January 2012. Retrieved 10 January 2012. ↑ "Hull City sack manager Nick Barmby". BBC Sport. BBC. 8 May 2012. Retrieved 12 May 2012. ↑ "Official Statement". The Tigers Official Website. Hull City A.F.C. 1 May 2012. Retrieved 1 May 2012. ↑ "Steve Bruce appointed Hull City manager on three-year deal". BBC Sport. BBC. 8 June 2012. Retrieved 12 June 2012. ↑ "Hull 2 – 2 Cardiff". BBC Sport. BBC. 4 May 2013. Retrieved 13 May 2013. ↑ "Watford 1 – 2 Leeds United". BBC Sport. BBC. 4 May 2013. Retrieved 13 May 2013. ↑ "Hull City 5–3 Sheff Utd". BSkyB. 13 April 2014. Retrieved 14 April 2014. ↑ Reid, Jamie (17 May 2014). "Aaron Ramsey steers Arsenal to victory in epic FA Cup Final". The FA. Retrieved 17 May 2014. ↑ "AS Trencin 0–0 Hull City". BBC Sport. BBC. 31 July 2014. Retrieved 31 July 2014. ↑ "Hull 2 – 1 AS Trenčín". BBC Sport. BBC. 7 August 2014. Retrieved 17 June 2015. ↑ "KSC Lokeren 1 – 0 Hull". BBC Sport. BBC. 21 August 2014. Retrieved 17 June 2015. ↑ "Bruce Agrees New Deal". The Tigers Official Website. Hull City A.F.C. 11 March 2015. Retrieved 12 March 2015. ↑ "Steve Bruce confirms signing new three-year deal with Hull City". BBC Sport. BBC. 13 March 2015. Retrieved 13 March 2015. ↑ "Hull 0–0 Manchester United: Steve Bruce's men suffer final-day relegation". SKY Sport. 25 May 2015. Retrieved 17 June 2015. ↑ "Bruce Delighted To Take Tigers Through". Hull City A.F.C. 27 October 2015. Retrieved 27 October 2015. ↑ "Hull 1–1 Leicester". BBC Sport. BBC. 27 October 2015. Retrieved 27 October 2015. 1 2 3 Young, Colin (9 August 2013). "EXCLUSIVE: Premier League refuse to approve 'Hull City Tigers' name change as chief's attempts cause outrage with fans". Daily Mail. Retrieved 18 January 2014. ↑ "Hull City to be renamed as Hull City Tigers 'to strengthen identity'". Press Association. 9 August 2013. Retrieved 18 January 2014. 1 2 Campbell, James (26 August 2013). "Hull City protesters: 'Our banner will be at every game'". Hull Daily Mail. Retrieved 18 January 2014. 1 2 3 Conn, David (12 September 2013). "Assem Allam courts controversy and hands Hull City an identity crisis". The Guardian. Retrieved 2 December 2013. 1 2 3 "It'll be MY promotion party, says Allam". The Daily Mail. 6 May 2013. Retrieved 18 January 2014. ↑ "Hull City: Tigers chairman dismisses fans' protests". BBC News. 12 November 2013. Retrieved 18 January 2014. ↑ "Hull owner Assem Allam: Critics 'can die as soon as they want'". BBC Sport. 1 December 2013. Retrieved 2 December 2013. ↑ Hunter, Andy (1 December 2013). "Steve Bruce admits threat of rebranding makes Hull City burn bright". The Guardian. Retrieved 2 December 2013. 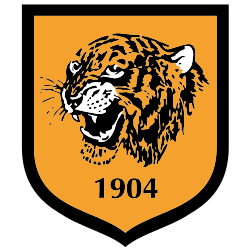 ↑ "Hull City formally apply to FA for name change to Hull Tigers". Press Association. 11 December 2013. Retrieved 13 December 2013. 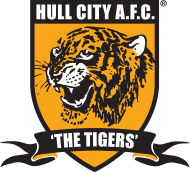 ↑ "Hull City: Hull Tigers name change submitted to FA". BBC Sport. 11 December 2013. Retrieved 18 January 2014. ↑ Conn, David (12 December 2013). "FA to consult Hull City fan groups before considering Tigers name change". The Guardian. Retrieved 13 December 2013. 1 2 3 "Could Assem Allam's Tigers name change benefit club?". BBC News. 16 January 2014. Retrieved 18 January 2014. ↑ "Hull City: FA set to reject name change to Hull Tigers". BBC Sport. BBC. 17 March 2014. Retrieved 17 March 2014. ↑ "Hull City accuse FA of 'prejudice' over bid to change name to Tigers". Press Association. 18 March 2014. Retrieved 26 March 2014. ↑ "Hull City 'Tigers' ballot: Fans' group says 'loaded' question will skew result". Hull Daily Mail. 22 March 2014. Retrieved 26 March 2014. 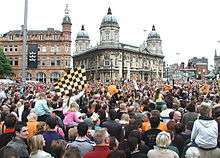 ↑ "Hull City: Fans narrowly back Tigers name change in ballot". BBC Sport. BBC. 7 April 2014. Retrieved 8 April 2014. 1 2 "Hull City: FA Council rejects proposed name change to Tigers". BBC Sport. 9 April 2014. Retrieved 9 April 2014. ↑ "Hull City: Owner Assem Allam says club put up for sale". BBC Sport. BBC. 11 September 2014. Retrieved 11 September 2014. 1 2 "Assem Allam: Hull City owner prepared to stop spending". BBC Sport. 3 October 2014. Retrieved 29 March 2014. ↑ "Hull City told they can reapply for Tigers name change". BBC Sport. 16 March 2015. Retrieved 17 March 2015. ↑ "Hull City lose FA vote to change name to Tigers for the second time". BBC Sport. BBC. 11 July 2015. Retrieved 11 July 2015. ↑ Nicholson, John; Beill, Andy (4 January 2005). 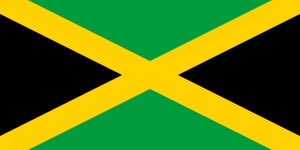 "1904–1939". Hull City Mad. Retrieved 26 February 2011. ↑ Nicholson, John; Beill, Andy (4 January 2005). 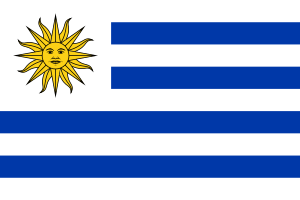 "1945–1968". Hull City Mad. Retrieved 26 February 2011. ↑ Nicholson, John; Beill, Andy (30 May 2005). 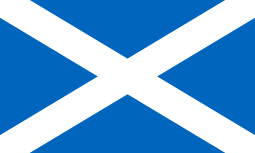 "1968–1990". Hull City Mad. Retrieved 26 February 2011. ↑ Nicholson, John; Beill, Andy (4 January 2005). 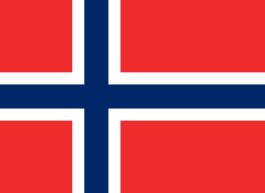 "1990–2000". Hull City Mad. Retrieved 26 February 2011. ↑ Nicholson, John; Beill, Andy (13 August 2009). "2000 – present day". Hull City Mad. Retrieved 26 February 2011. ↑ "Hull City unveil new club crest for 2014–15 season WITHOUT the team name on it". Daily Mail. 20 June 2014. Retrieved 20 June 2014. ↑ "Hull City Announce Umbro Kit Deal". The Tigers Official Website. Hull City A.F.C. 20 April 2014. Retrieved 21 May 2014. ↑ "Tigers Announce New Shirt Sponsor". Hull City A.F.C. 10 July 2015. Retrieved 10 July 2015. ↑ "Tigers Announce New Official Sponsor". Hull City A.F.C. 25 July 2016. Retrieved 25 July 2016. 1 2 Beill, Andy (5 November 2004). "The Boulevard". Hull City Mad. Retrieved 26 February 2011. 1 2 Beill, Andy (5 November 2004). "Anlaby Road". Hull City Mad. Retrieved 26 February 2011. ↑ "A History of Boothferry Park". Hull City A.F.C. 27 May 2010. Archived from the original on 13 February 2010. Retrieved 11 July 2011. 1 2 3 4 5 "Blowing the whistle: Time's up for financial secrecy" (PDF). Christian Aid. May 2010. Retrieved 26 January 2014. ↑ Conn, David (31 March 2010). "Hull City owner Russell Bartlett trades £4m loan deals with the club". The Guardian. Retrieved 26 January 2014. ↑ "Allamhouse Limited profile". CompanyCheck. Retrieved 26 January 2014. ↑ "Allamhouse Lts legal information". CompaniesInTheUK. Retrieved 26 January 2014. ↑ "Who's Who at the KC". Hull City A.F.C. Retrieved 26 January 2014. 1 2 3 4 5 "Planet Football: Hull City". Private Eye (#1355): p. 33. December 2013. 1 2 3 4 Peterson. The Definitive Hull City A.F.C. : A statistical history to 1999. p. 5. ↑ "Liverpool 6–1 Hull". BBC Sport. BBC. 28 December 2013. Retrieved 28 December 2013. ↑ "Find out about Hull City Football Club". BBC Where I Live Humber. BBC. Archived from the original on 8 November 2012. Retrieved 12 October 2014. ↑ Stevenson, Jonathan (26 September 2009). "Liverpool 6–1 Hull". BBC Sport. BBC. Retrieved 28 December 2013. ↑ Reekie, Harry (9 May 2010). "Hull 0 – 0 Liverpool". BBC Sport. BBC. Retrieved 11 July 2011. ↑ "Shane Long Southampton deal confirmed: Leaves Hull City for 'undisclosed fee'". Hull Daily Mail. Retrieved 16 August 2014. ↑ "Hull City Complete Club Record Signing". The Tigers Official Website. Hull City A.F.C. 1 September 2014. Retrieved 12 October 2014. ↑ "Premier League: Hull City record signing Abel Hernandez turned down Benfica offer". Sky News. 11 September 2014. Retrieved 12 October 2014. ↑ "New Signings Allocated Squad Numbers". Hull City A.F.C. 2 September 2016. Retrieved 2 September 2016. ↑ Beill, Andy (27 August 2002). "Greaves Goes". Hull City Mad. Retrieved 1 April 2013. ↑ "Who were the winners at our official awards evening?". Hull City A.F.C. 20 April 2013. Retrieved 21 April 2013. ↑ "Davies Scoops Top Prize". The Tigers Official Website. Hull City A.F.C. 7 May 2014. Retrieved 7 May 2014. ↑ "Michael Dawson named Hull City's Player of the Year by Mail readers". Hull Daily Mail. 3 May 2015. Retrieved 5 June 2016. ↑ "Hernandez At The Double At Player Of The Season Awards". Hull City A.F.C. 3 May 2016. Retrieved 7 May 2016. ↑ "Manager History for Hull City". Soccerbase. Retrieved 6 June 2013. ↑ "Who's Who". Hull City A.F.C. n.d. Retrieved 24 August 2016. ↑ "New Staff Announcement". The Tigers Official website. Hull City A.F.C. 29 June 2012. Retrieved 29 June 2012. ↑ "Hull City: Neil McDonald named assistant coach". BBC Sport. BBC. 24 October 2016. Retrieved 24 October 2016. 1 2 "Hull City AFC Reserves 2010/11". Hull City A.F.C. 5 May 2011. Retrieved 11 July 2011. ↑ "Juniors". Hull City A.F.C. Retrieved 19 June 2007. ↑ "Hull City Ladies". Hull City A.F.C. 17 May 2007. Retrieved 19 June 2007. 1 2 3 "Rivalry Uncovered!" (PDF). Football Fans Census. Retrieved 15 July 2007. ↑ "Hull City Online Vote Interactive". Hull City Mad. Retrieved 19 July 2007. ↑ "League Tables". Blades-Mad. Retrieved 16 July 2007. ↑ "Tigers suffered turf moor heartache". Hull Daily Mail. 2 May 2008. Retrieved 11 July 2011. ↑ "It is often thought that promoted clubs begin the following season on a high with the same buoyancy, spirit and togetherness providing a knock-on effect". Hull Daily Mail. 8 April 2000. Retrieved 11 July 2011. ↑ "Trio to miss Humber derby". Scunthorpe United F.C. 21 November 2007. Retrieved 11 July 2011. ↑ Nicholls, Andy; Lowles, Nick (September 2005). Hooligans: The A-L of Britain's Football Hooligan Gangs. Wrea Green: Milo Books. p. 272. ISBN 1-903854-41-5.